I'm back! Almost 100%...but not quite. Whatever is going around is brutal! It may take me a bit to get ramped up to speed - but I'll do my best. My hubs thinks it's hilarious that I'm still half incapacitated, yet I'm doing a mani and posting about it. So hilarious! Right?! No! Manis are serious business. But given my less than optimum self, today's mani is super simple. I've used two more polishes from the China Glaze Spring 2013 Avant Garden Collection. I started with two coats of Passion for Petals as the base. It looks mauve in a lot of promo shots, but it seems more like a dark coral on me. I taped diagonal tips in random sizes with random center points and polished a generous coat of Mimosa's Before Mani's, a brighter coral with some shimmer. You really have to enlarge the pics to catch any glimmer though. 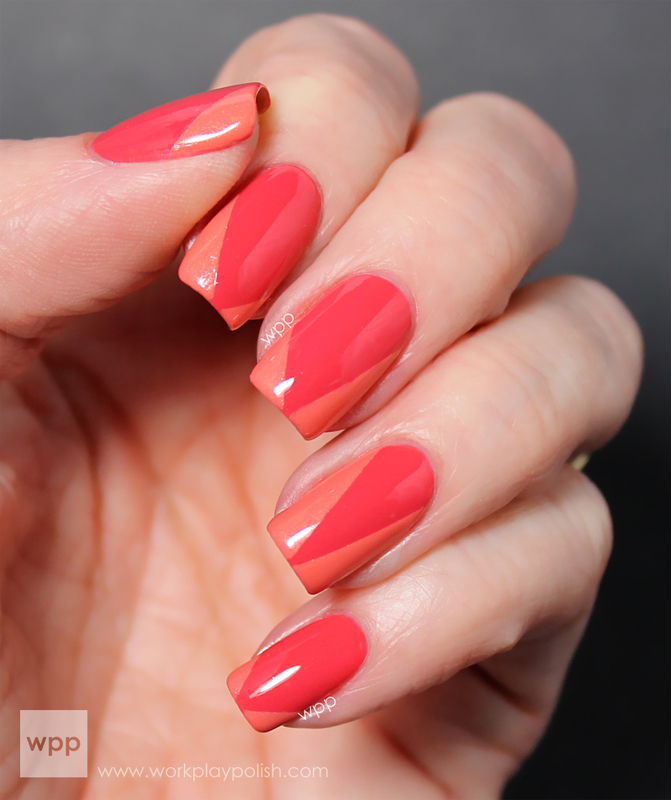 I'm not a huge fan of coral, but I think this is a pretty combination and the polishes applied really well. What drives me crazy is the apostrophe in "Mimosa's Before Mani,s"! Why? Oh why?